Australia is the sixth-largest wine producer in the world, but more than half of the 1.75m t/y of grapes pressed end up in landfill. This waste has minimal nutritional value and is difficult to digest, so it cannot be used as animal feed, and it does not compost well as it does not degrade. It is therefore usually landfilled. The EU recently classified winery waste as a pollutant, giving extra incentive to find a use for it. 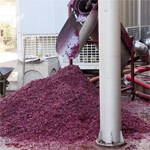 Avinash Karpe at Swinburne University of Technology investigated ways to break down this winery biomass, which mostly consists of cellulose, pectin and lignin. “Various fungi are known to degrade this waste by generating an array of enzymes. “These enzymes convert the waste to soluble sugars which can then be converted into other products,” says Karpe. Karpe uses four fungi, Trichoderma harzianum, Aspergillus niger, Penicillium chrysogenum and Penicillium citrinum, all of which produce enzymes which break down the components of winery waste. He incubated the fungi with the waste for 1–3 days. A 30-minute heat pre-treatment improved the breakdown of the biomass. Using gas chromatography mass spectrometry, Karpe found that 78 metabolites were produced in the reactor including stigmasterol, glycerol, maleic acid, xylitol and citric acid. As well as for biofuels, the compounds would be of interest for industrial and medicinal purposes.